Ditched the panigali for a new S1000R and absolutely love it. What I don't love is the low DB tone from the Cat. Read lots of useful posts on here on earlier models but still no conclusive answer on fuelling after header change. I really want a louder system but Dyno don't offer pc for my year model and I don't want to run it lean and f##k it up especially as BMW clearly stated it will invalidate warranty. Anyone ran this gauntlet ? After I had the headers fitted, I then found out that there was no PC offered by Dynorod due to the problem with the engine warning light. I have been running around as it is now since November with no real detriment. Yes, the revs are a little lumpy below 3000rpm, but once you twist the right hand, it sounds and performs gorgeously. Thanks, did you fit them yourself ? Any warranty voiding issues from your dealer ? Spoke to Calsport yesterday, they offer a piggy back power commander "rapid evo" that learns and re fuels as you ride. Apparently when you unplug it everything goes back to normal so doesn't affect stock ecu. Not sure if anyone has tried this.. If you don't want to screw up the fueling or bother with piggyback ecu's etc .... I really would advise giving just the Akra GP can a try first. Similar to you, I came from a Ducati with a full SC Projects system, so the volume was turned up to 11. While the stock Akra (I have a 2017 model by the way) sounds decent, it is definitely lacking in tone and volume. I have fitted just the can to mine for now as I don't want to ruin the fuelling and to be honest it does sound great and I now have no desire to fit headers purely for a bit more volume, and I don't want the loss in power either. While the bike isn't as loud as my Ducati was, people still comment on how loud it is and how nice it sounds. To put it in to context, a couple of my friends have KTM 690 SMC's with open pipes and they can hear me over their bikes when I am behind and infront of them. If you're still not happy once you've fitted and tried the can, then you haven't really lost anything as the titanium headers can easily be bought and fitted at a later date. I was lazy and had the dealer fit the exhaust. 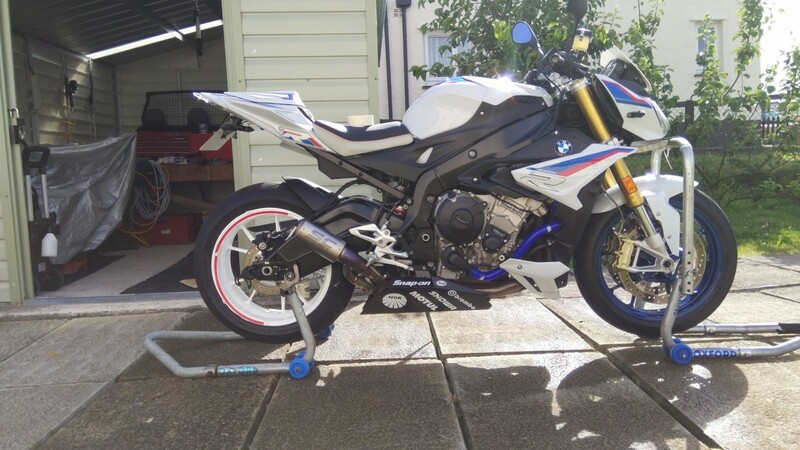 Only after fitting the exhaust did they (the dealer) find out that BMW do not offer a release code for the 2017+ model - that is the ECU is locked. I have heard of the Rapid Bike range, and there is someone on the forum that has one (he mentioned it, hence i learnt of its existance) but I would like more experienced information. 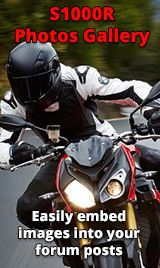 I would opt for the simplist application, the Rapid Bike Easy http://www.dimsport.it/en/rapidbike/easy/. Cheers lads, rumour is all baffling done in the cat so whipped the end can off today and went for a blast. No real change idle but sounds great at revs pops on bangs like thunder :001:so will get the slip on ordered tomorrow. Where did everyone buy the race can from ? I bet that looks and sounds awesome, my akro GP can arrived yesterday. Fitted the new end can does make a noticable difference so happy boy for now and may still keep my warranty. Full system is the way I'll be going after warranty period ends.